The Berkeley Public Library is approaching its 38th quilt exhibit at the Central branch, May 6 through June 29, 2019, and I will be exhibiting my lichen quilt. With only small quilts on display this time, each of us was also asked if we had a postcard-sized quilt to show. Quilts have been a medium where I can work large, so I didn't have anything made. And I have many book projects in the works, so I wasn't sure I could put new thought into a new tiny piece. I sorted through my scraps from previous quilts to see what I might find. I had two large pieces from Almost Cherry Season, but they were so nice I didn't want to cut them up. I finished that quilt a year ago and felt like I wanted to revisit it. Then there was the experiment of eco-printing cherry pits and stems (with the cherry juice on them) that I had made. I found a scrap of the poem. And the tiny quilt started to come together. A dream of a printed red cherry fragment inspired me to look for cherries in the market, but they were not in season yet, so I wrote a poem thinking about spring, anticipation, and the migrant workers who pick the cherries. This led me back to a book by a co-worker that featured poems about his Filipino family and their life as migrant workers. Thinking I would ask him for a poem for the literary magazine I publish, I looked him up online, but the first page of the search was his obituary. “Picking Cherries” contains my poem fragment and is based on a larger quilt called “Almost Cherry Season,” in memory of poet Kenneth Zamora Damacion. Lichen, a dual organism (possibly triple) continues to inspire me; it cannot be cultivated, and it is sensitive to environmental change. I have drawn it, printed it, and my poem, “They Must Agree” was published in 2016, issue #7 of Split Rock Review. I started the quilt with the poem in mind, and over two years it became my travel project, embroidered in between stops, mostly on airplanes. 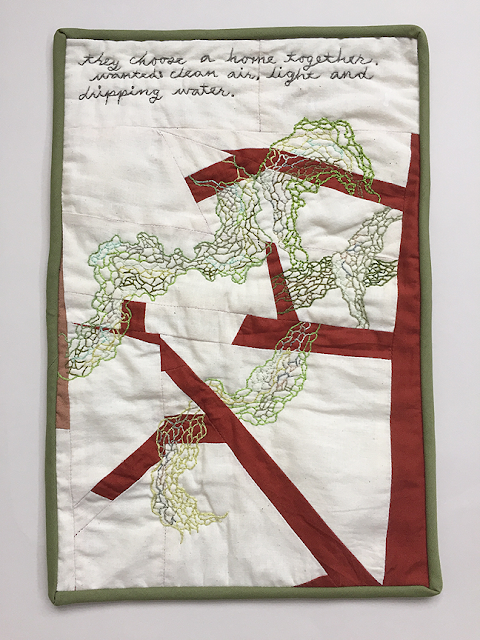 The quilt depicts lace lichen and contains a snippet of the poem. where folks will also talk about their quilts.